Sleep apnea is one of the most common sleep disorders afflicting approximately 20 million adults in the U.S. with an estimated 80% of cases going undiagnosed. Many people may be unaware that a sleep disorder is the underlying cause of their health problems, and others may be aware of their sleep disorder but uninformed of the severe consequences of untreated sleep apnea. Sleep apnea is characterized by frequent breaks or pauses in breathing during sleep. There are 3 forms of sleep apnea: Central sleep apnea (CSA) in which the pauses are due to the brain failing to signal the respiratory system to breathe; obstructive sleep apnea (OSA) in which breathing is interrupted by a physical blockage in the upper airways, often caused by soft tissues of the throat and tongue collapsing into the airway; and complex/mixed sleep apnea which is a combination of central sleep apnea and obstructive sleep apnea. Obstructive sleep apnea is by far the most common of the sleep apneas accounting for approximately 85% of cases. Central sleep apnea accounts for less than 1%. Snoring: Loud, chronic snoring is one of the most frequently cited symptoms of sleep apnea. Snoring is the sound produced by vibrations in the upper respiratory airways during sleep. It is caused by partial blockage or obstructions as air is being restricted from moving easily through the airways. Many people who snore may not even be aware that they do so and are only alerted to it by an annoyed bed-partner whose sleep is disturbed due to the loud noises coming from the other side of the bed. While snoring is a common symptom of sleep apnea, it doesn’t necessarily indicate that the person has the disorder. Many people who snore don’t have sleep apnea, and some people with sleep apnea don’t snore. However, if your snoring is loud, disruptive, and occurs on a nightly basis, it could very well be a sign of sleep apnea, and you may want to discuss your snoring with your primary care physician to see if it may be sleep apnea. Frequent breaks or pauses in breathing: In obstructive sleep apnea, the fatty tissues of the throat or tongue become relaxed during sleep and fall back into your airways which restricts airflow and causes you to stop breathing for a few seconds. During an apnea event, the oxygen levels in your blood drop. This causes your brain to wake itself from sleep long enough jump start your respiratory system into working properly again and get air past the blockage. While your brain partially wakes up to respond to the interruption in breathing, you still remain mostly asleep without realizing that you partially awoke. But while you may not realize that you frequently wake during sleep, the constant interruptions have a negative impact on the amount and quality of sleep you get which lead to many of the other symptoms on this list. Apnea events can occur anywhere between 5 to 30 times in an hour lasting up to 10-20 seconds at a time. Those with severe obstructive sleep apnea can experience hundreds of apnea events a night. If you’ve been told that you frequently stop breathing in your sleep, it’s time to talk with your doctor or schedule an appointment with a sleep specialist. You’re Tired all the Time: While you may think you got plenty of sleep during the night because you were in bed for 7-9 hours overnight, all of those pauses and interruptions to your sleep add up to a lot of lost time in quality and quantity of nightly sleep. One of the most common (but frequently overlooked) symptoms of sleep apnea is excessive daytime sleepiness (EDS). EDS is characterized by a chronic feeling of overwhelming daytime fatigue. Common symptoms of EDS are: difficulty waking in the mornings, feeling excessively tired all day long, a general lack of energy, needing or taking frequent naps that only partially (or not at all) relieve symptoms, dozing off at inappropriate times, and difficulty concentrating among others. Daytime drowsiness can even lead to serious accidents or even death especially if the sufferer is driving or working on or around heavy equipment or machines. 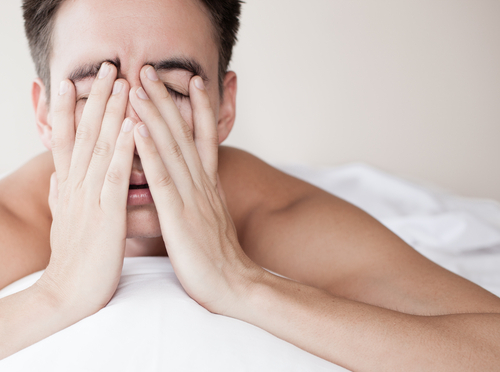 You frequently wake with headaches: Headaches are commonly reported by sufferers of sleep apnea. As you stop breathing frequently during the night, less oxygen is making its way to your brain. Low oxygen levels initiate the widening of blood vessels and can cause vascular headaches. Along with excessive daytime drowsiness, headaches are usually the symptoms that sleep apnea sufferers complain the most about as they may not be aware that they have symptoms of snoring or breaks in breathing. You Have High Blood Pressure: Hypertension is commonly linked to sleep apnea. For the same reasons you experience headaches due to frequent pauses during sleep, you can get high blood pressure. As your brain wakes from sleep as it realizes that its not receiving adequate oxygen levels in the blood it causes a spike in blood pressure as it restricts your blood vessels to kick starts your system into working again. When this happens repeatedly throughout the night to combat every apnea event, your body gets used to having to restrict its blood vessels and high blood pressure begins to persist even during the day when you are breathing normally. You are overweight or obese: In many cases a person’s body weight is directly linked to having obstructive sleep apnea. People who are overweight or obese are more likely to have sleep apnea than those that maintain healthy weights. Sleep apnea can often be caused by excess fatty tissues that become built up in the neck and throat. The excess tissues can fall back into the airways during sleep causing obstructions to the airways and leading to apnea events. If your neck circumference is greater than 17 inches for men or 16 inches for women you have a higher risk of sleep apnea due to fatty tissue buildup surrounding your airways which can cause restrictions in breathing during sleep. You are often irritable, depressed, or experience mood swings: Lack of quality sleep can affect a person’s mood. Losing sleep nearly every night can make you more irritable, prone to anxiety, short-tempered, and over a long enough time even depressed. If you think your mood swings or depression may be caused by a lack of sleep contact your primary care physician to see if it’s related to a sleep disorder. If you have experienced any of the previous symptoms, it may be time to contact a sleep specialist to schedule a sleep study. Left untreated, sleep apnea can cause a whole slew of medical problems and can put you at an increased risk for many health issues including: heart failure, arrhythmias, gastroesophageal reflux disease, diabetes, stroke, and heart attacks. At the Sweet Sleep Studio, we diagnose and treat many cases of sleep apnea every year. Because treatment for sleep apnea through continuous positive airway pressure (CPAP) therapy or other alternative treatments is so effective, there’s no reason to have to live with sleep apnea or any of its debilitating symptoms. Contact Sweet Sleep Studio at 913-306-5963 to talk to our board-certified sleep specialist today.